For the record, there is no eleventh commandment that says, “Thou shalt not enjoy life.” Nor does God ever say, “My plan for you is to be miserable on earth until you arrive in heaven.” Rather, the earth reflects a joyful Creator who gives us his creation for our pleasure. 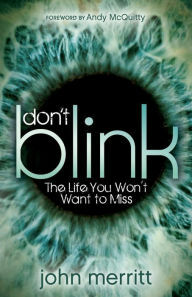 Don’t Blink is for procrastinators, dreamers, and would-be adventurers who wish to grab hold of life this day, knowing there are no guarantees about someday. From Alaska to Argentina to the Amazon―in situations ranging from dangerous to humorous―John Merritt takes you on a daring pilgrimage revealing what living in the moment looks like. John demolishes the notion that once you become a Christian your freedoms are gone and your fun is done. Life is an extraordinary adventure elevated to audacious heights when God is leading the charge. Whether on the other side of the world or in your own backyard, you will be inspired to squeeze more joy out of the life God has given you.